Please help us save Maple Avenue. Thoughts from the families who live on or near Maple. 212 W. Maple matters because it is a piece of Libertyville's heritage. The home at 212 W. Maple, built in 1900, was owned by Lewis B. Hanby and his wife, Laura Percy Hanby. At one time, Lewis Hanby was a member of the Libertyville village council and a director of the Lake County Fair. Lewis Hanby was born in New York in 1849 and came to Illinois in 1872. He began working in the area as a farm hand and lived with the family of his sister, Louisa Cater, and brother-in-law, John Cater. Later, he became a cattle buyer who was well known throughout the Midwest. In 1897, he married Laura Percy of Sodus, New York, and they made a home together on Maple Avenue, then known as Division Street, in Libertyville. By 1910, he had retired from his business due to ill health, and he passed away at home in January 1929. Lewis’s wife, Laura, was an active member of the Methodist Church of Libertyville and sang in the choir. She passed away in February 1939. First Pres wants to expand/update their church which, per current Libertyville zoning, requires that they add 350 new parking spaces or is it 350 additional parking spaces? Tearing down one house only adds an extra 30-60 spaces? And the church will lease the rest of the spaces from the high school. Why can't they lease all of the spaces from the high school? Is there a concern (which seems awefully valid) that once the village sets a precident by allowing one home to be destroyed the church is hoping that the other four homes they own can be torn down to add the remaining parking and/or church improvements? Has even one family living on Maple/Douglas/Stewart (on the north side of 176) supported the church's request? And knowing that so many -- if not all -- of the families who live near the church oppose rezoning, the village still voted to do it? Has the church offered any alternatives to building a new parking lot? Has anyone suggested turning the entire east side of our street (east of Douglas) into a business zone and adding cul-de-sacs at the end? (So, Maple would end at Douglas to limit through traffic.) I'd imagine the people who live on Stewart would want the same. We moved to Libertyville in late summer 2007. Like the Youngs, we previously lived in a walkable Chicago neighborhood, and we were looking for a neighborhood with a similar feel in Libertyville. We were so excited to find our house on Maple Avenue, a 1920 American Foursquare. We took many walks around the area that summer and would often make lists of all the places and events in town that we can easily reach on foot: Cook Library, Cook Park, Butler Lake Park, Sunrise Rotary Park, Libertyville High School, the Farmer’s Market, Out to Lunch, Streetdance, numerous restaurants and shops, banks, and the train station. I commute to downtown Chicago, so being able to walk to the train station is particularly important, and it’s enabled our family to rely on just a single vehicle despite living in the suburbs. Our house was among several others in the neighborhood featured in a historic walking tour this past summer. I researched its history and, among other things, discovered that it was built by a retired milk dealer from Chicago. In the course of my research, I learned a lot about the historic residences in the area and their previous owners, and I began to feel a link to Libertyville’s past despite the fact that I had just moved here. They really don’t build homes like they used to, and it is crucial that we be able to reflect architecturally Libertyville’s past. 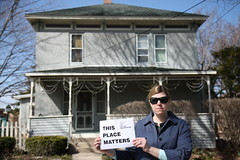 If the home at 212 W. Maple is allowed to be demolished, we will lose one more link to our village’s heritage. It will be a terrible blow to our beautiful, unique, historic neighborhood. Our family moved to Libertyville just this past June from the Wicker Park neighborhood of Chicago. In making the move to the suburbs, it was important for us to find a home in a true neighborhood that was within walking distance of shops, restaurants and activities for the kids. We had lived on a landmark street in a home that was over 100 years old and wanted to find a similar street in Libertyville. Thankfully, we did and are very happy with our decision. This winter, when the first notice about the proposed parking lot arrived, I was surprised but thought that there was just no way that our village would allow rezoning for a parking lot. It just seemed ridiculous to me, but that may be because I don’t understand the culture of suburbia quite yet. You see, city churches like Moody, ask parishioners to use parking lots within a few blocks of their church as well as public transportation. As you can see from their map, attending a service may require parishioners to take a little walk. I continue to be shocked that rezoning our residential street is being considered. While I understand First Presbyterian’s need to update and grow their property and I commend them for their good works in the community, I don’t understand the need to take away from a family neighborhood to save a few steps. Everything is convenient - schools, downtown, library, church, ballparks, train. And, of course, the schools are good. My daughter, who is graduating next year, has only known Libertyville public schools. Indirectly, I think the neighborhood infrastructure has helped us raise our kids. Part of this is about the safety of the larger community, but some of it comes from the stability of the neighborhood. People tend to stay because this is NOT a cookie-cutter neighborhood. That also helps make for a safer community. When our kids were small, we didn't worry nonstop about them when they were out, playing in the neighborhood. We still call it "Mayberry." These kinds of places just don't exist any more. Also, because the lots are smaller and flats are mixed with single family homes, I think there is more chance of there being more kids in the neighborhood. That's important when you're raising kids. It keeps them from being bored and helps shift the burden of entertainment away from the parents. My son and our next door neighbor's daughter are like brother and sister. Last weekend, she was bat mitzvahed. Our son, Christian, played a central role in the weekend celebration, even though Christian is a Christian. That's because he is this girl's oldest friend, and one of her closest friends. These kids grew up in each other's houses. I'm guessing Christians and Jews don't have a lot of chance to get together and comfortable like this, and this neighborhood helped make that happen. Our neighborhood helps support diversity of people, because it is architecturally diverse - not cookie-cutter. Now, as my kids have grown older, especially with my son and his friends, we find our home is a gathering place. Kids stop by -- because we're central we find we're a point of departure. (One of my daughter's high school friends parks in our driveway because we're close to school and parking is jammed at the school.) Kids also stop by because they like being in an interesting part of town and because they can use our house as a base to further explore downtown with its library, and Cook Park, the theater, and Starbucks. Again, all of this helps my wife and I, in daily, micro ways, to raise our children as socially aware and experienced people. We don't have to chauffeur them everywhere and artificially support their experiences - the world comes to them or is easily accessible to them. Not to be underrated these days, we're all, as a family, less sedentary because we can easily walk to so many destinations. My wife's teaching colleagues also love to congregate at our home, as does our extended family. They love to come because of the charm of our home and the street. On warmer days, people love to sit out on our deck and take in the neighborhood charm, and know they are close to town with its amenities, but they also enjoy the parade of passersby. And again, because the homes and accompanying lots are smaller, there is more intensity/interesting experience of the neighbors. I fear if the Village lets Maple become a dead street, all of that will be affected - for the worse. We want the neighborhood to get more lively - not less. We're very concerned that fewer homes and more institutional church space (including parking) that is only active a limited amount of time during the week will begin to make evenings and large parts of the weekend less lively, even dead. People are not attracted to these kinds of neighborhoods, and will move elsewhere, if they are able. And then, all of the above starts to go away. . . Welcome to Saving Maple, a blog built by the families who live on or near Maple Avenue in Libertyville, IL. We love the character of our neighborhood and hope that by sharing our stories here, we can help to save one more historic home from demolition. Please listen and share with an open mind and with respect for all opinions.